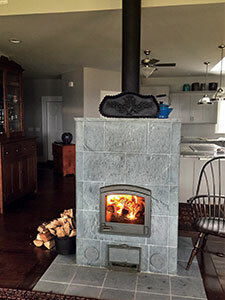 Chad Turpin has always enjoyed the comfort of having a wood-burning fireplace in the home. However, he became frustrated to find they can actually work at a negative efficiency—drawing hot air up the chimney and leaving the rest of the home chilly. 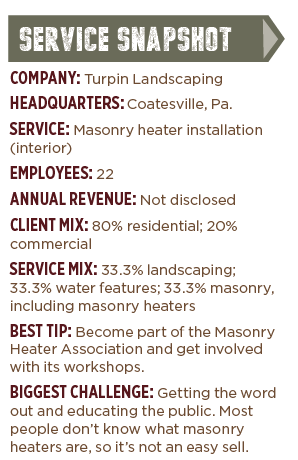 About a decade ago, the co-owner of Turpin Landscaping in Coatesville, Pa., was flipping through the paper and discovered an ad for a masonry heater—a renewable heat source that is popular in Europe but remains a relatively new concept in the U.S. He was intrigued. Since then, his company signed on as a dealer for masonry heater manufacturer Tulikivi, and he begun installing masonry heaters as an additional service to the landscape business he owns with his brother. Though it’s only about 1 percent of the company’s revenue right now, Turpin says installing masonry heaters provides the business with some off-season work. And he foresees it growing. The biggest challenge has been educating potential clients. In addition to including information on the company’s website and striving to educate clients face-to-face, the company has gotten involved with the nonprofit Masonry Heater Association (MHA), which is committed to educating the public about these products. Adding this service wasn’t a small feat. The first system the company built as part of Tulikivi required flying in a professional to oversee the process. And becoming a dealer required specialized training from the MHA. Turpin estimates the investment to begin offering masonry heater installations and become a dealer at $30,000 or more. However, a company could get into the service without becoming a dealer for around $10,000, he says. Providing a service inside the home also may be a challenge for some landscape businesses. It wasn’t an issue for his staff, Turpin says, because his company already did some installations that required crews to get inside for electrical and plumbing work. Along with educating clients, finding the right clients has been challenging. Installing a masonry heater starts at $18,000, but a complicated retrofit can go anywhere up to $68,000, Turpin says. Since new builds are the ideal target, the company is working with local builders and architects to educate them about masonry heaters. Turpin Landscaping also plans to install one of these systems at its headquarters and at the Paoli Design Center in Paoli, Pa., which is a high-end interior design showroom offering unique options for homeowners. With more than 15 years in business, Turpin says he’s also learned never to underestimate the power of word of mouth. Payton is a freelance writer with eight years of experience writing about the landscape industry.